I am not sure why eating the flowers of plants is such an uncommon practice. Perhaps it is because we wait patiently for them to emerge and then really enjoy looking at them in the garden. Or, maybe it is because their perfection is fleeting. Kathy Brown gives us a million reasons to grow and use more flowers. The first thing you notice about this book is all the incredible photos. In 160 pages, there are 400 color photos. 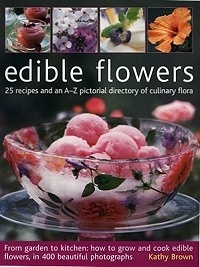 There are not only photos of the 45 edible flowers she covers but also of the plants they grow on, containers she has planted them in and step by step guidance on how to trim, sugar, and cook with the flower petals. While there are some tasty and unique recipes in this book, such as Bergamot Wild Rice Salad, it is her discussion of each plant and tips on growing it that make it a book of value to a gardener. Her tips for combing herbs in containers is fun and thoroughly covers all aspects of growing.